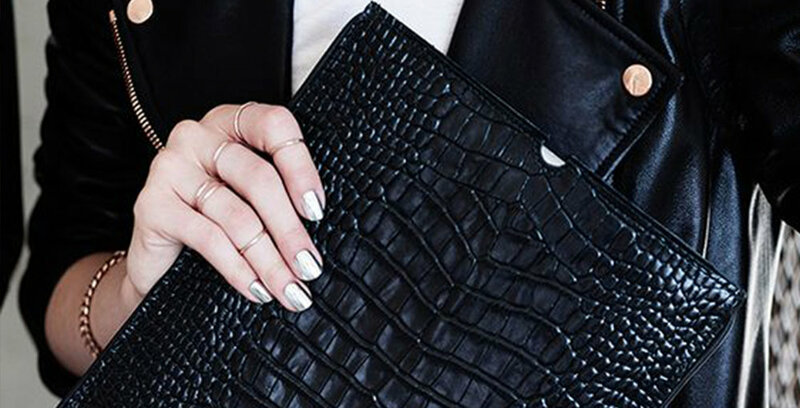 The winter season is well and truly upon us and with that comes the emergence of an autumnal favourite: the exotic skin handbag. While wintering in the sun, our client picked up a black semi-patent vintage gem in one of those uber-lux vintage resell shops in Miami Beach. Structurally, the bag was in great condition but the top handle, due to dryness and age, had an unmissable crack which highlighted the dried leather and exposed the animal’s natural dark green colour. We opted to do a combination repair and rebuild as it would have been unlikely to find a vintage croc skin to match the rest of the bag perfectly. The handle was typical, in that the top part was croc and the bottom part was a black cow leather. We removed the handle from the bag, unstitched it and took it apart. 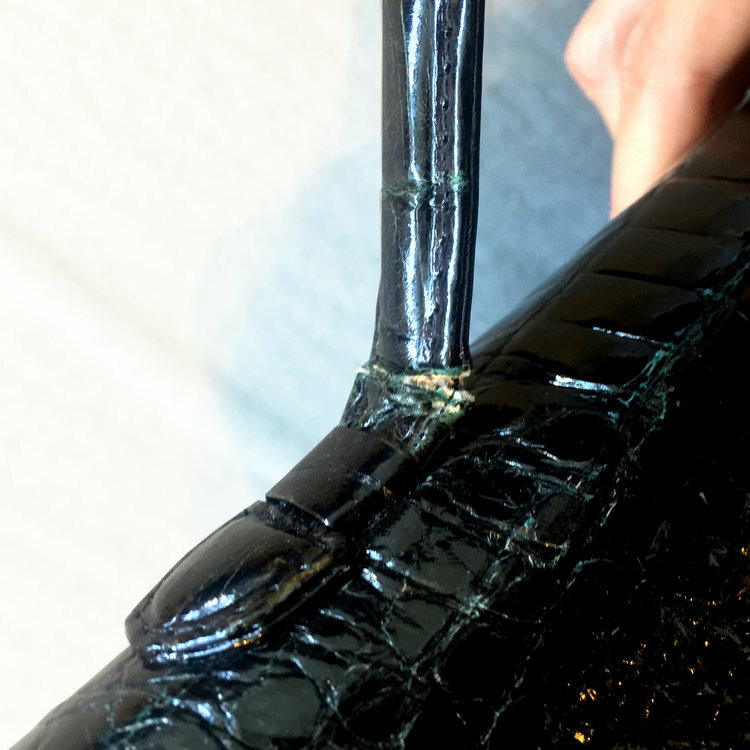 We were then able to patch-up the crack on the croc part from underneath with a thinly split piece of calf skin. 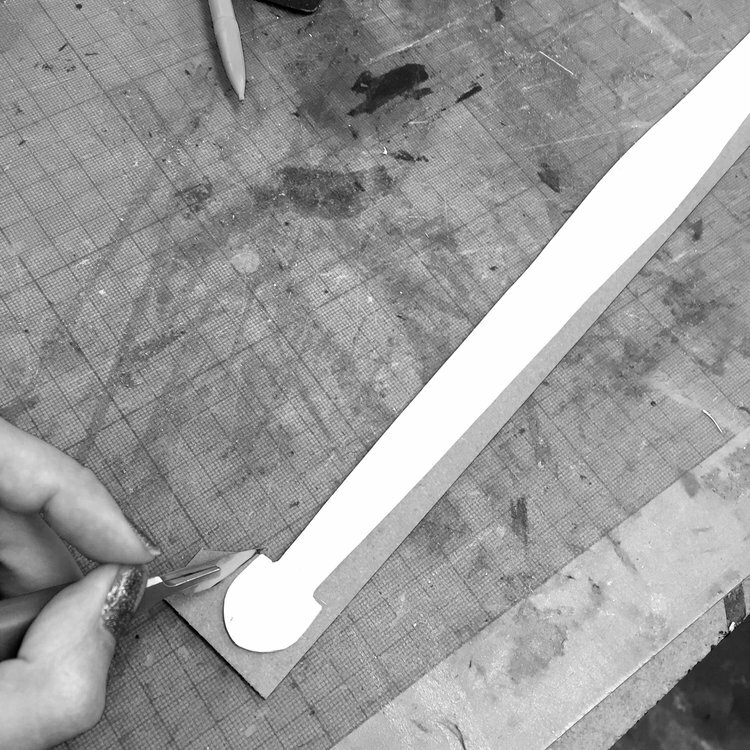 We then cut a fresh piece of leather reinforcer (a particleboard-type material that gives the handle its shape) and a fresh piece of cow leather for underneath. We colour restored the newly-patched croc skin and reassembled the handle. The handle was then hand stitched – making sure to go back in and out of the same holes – back onto the top flap of the bag.The whole body was then lightly colour restored, refinished and conditioned and the bright gold valentino-esque closure was polished. The crack is all but invisible, the bag has been restored to a deep shiny black and the hardware is shining bright. IF YOU ARE ABOUT TO OR HAVE ALREADY INVESTED IN AN EXOTIC PIECE, HERE ARE A FEW GENERAL CARE TIPS FROM OUR HEAD OF ATELIER, THAIS CIPOLLETTA. The basics. As with any leather, exotic or not, condition regularly with the appropriate product for your bags skin type. Always test it on a small hidden section of the item first. Don’t use baby wipes. But don’t over-condition. Applying conditioner every 3 months is sufficient as too much conditioning will trap moisture and encourage mould. If the exotic leather has a patent/ shiny finish use a product appropriate for patent. Polish the hardware of your bag, as keeping the metal parts of your bag shiny will remove that cloudy/mouldy look which naturally comes with age.